It's that time again! I hope everyone is doing alright in this crazy scramble to get everything together for that time of year, the one that creeps up on us... no, not Christmas! (Although, I'm definitely wanting to feel the winter chills right now in these Texas summer days) IT'S TIME FOR BACK TO SCHOOL! I know everyone is scrounging and getting things ready, those school supply lists are no joke! And then you tack on the clothing, the shoes, the lunches, oh man! That's why I'm going to insert this little secret discount right here. If you share my back to school mini ad on Facebook or Instagram, and TAG @TraciLynnPhotography, with the privacy setting as public and encourage your friends/family to book their little ones for a back to school session, comment on the ad and tag a friend, I'll give you a $10 credit towards your first online order! What's that? You want a cute print to show off? I got you boo! How about a free 5x7 for leaving a review after your session on Facebook? Have more than one kiddo? No prob Bob! (or Barb, or whatever your name is) We got this. 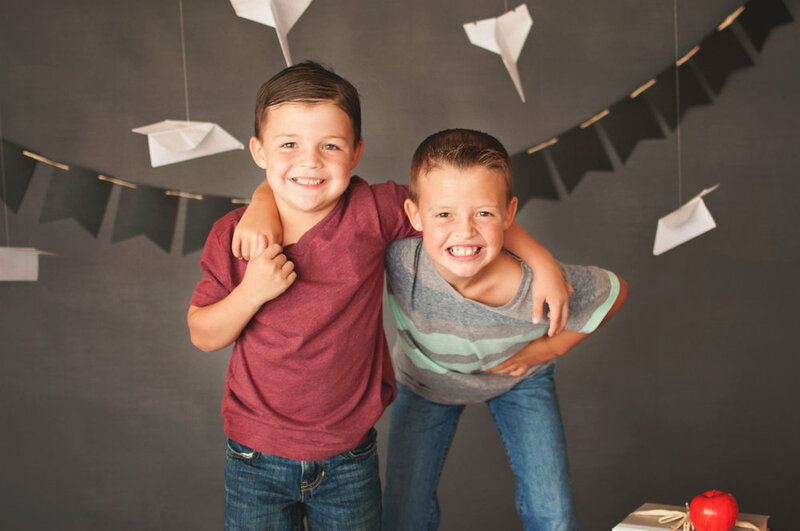 If you have 1-2 kiddos they're included in the session fee, if they're siblings. They'll get individual pictures and a picture or 2 together. Got more kiddos? Still all good! Add $25 per kiddo extra. Confused? Don't worry about it! Contact me and let's set it up. Each session comes with an online ordering gallery where you get to see all the best portraits we take in during the time slot. You can then order digitals, prints, or products from TLP's professional printing lab. Every order is processed, shipped, and delivered right to your door! This session is 20 minutes, so they're short & sweet. Come dressed to impress in your first days of school outfits and smile! Don't be nervous, I've been working with kiddos for over 8 years and have loved every second of it. Even the stubborn ones who think they're too cool to smile, I got this! Need more than 20 minutes? We can do that! Book a weekday evening and we'll get it set up! This mini offer is good until August 31st, that's the last day I'm doing these, but don't fret, you're welcome to set up a regular priced session any day by appointment.